Linear-chain conditional random fields (LC-CRFs) have been successfully applied in many structured prediction tasks. LC-CRFs can be extended by different types of deep models. 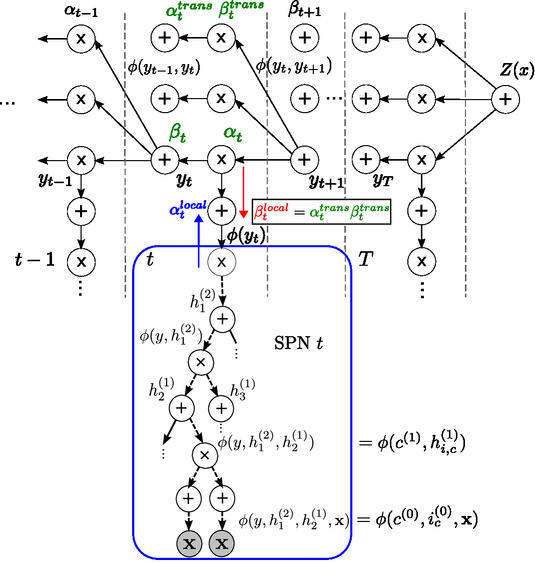 In a recently published paper, we extend conventional LC-CRFs by replacing the local factors with sum-product networks (SPNs), i.e. a promising new deep architecture allowing for exact and efficient inference. The deep local factors, we used, can be interpreted as an generalization of discriminative Gaussian mixture models (GMMs). Thus, we provide a powerful alternative to LC-CRFs extended by GMMs. In extensive experiments, we achieved performance competitive to state-of-the-art methods in phone classification and optical character recognition tasks.